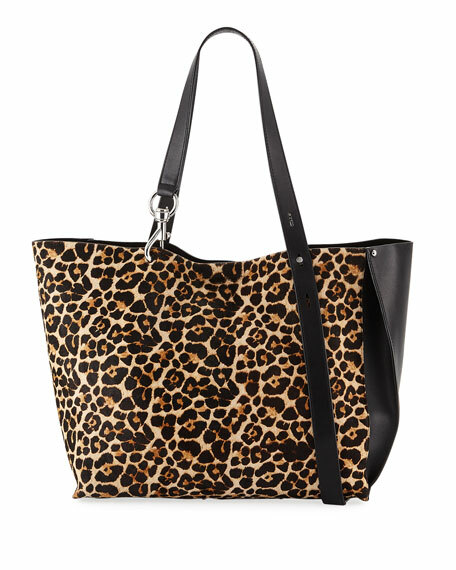 Rebecca Minkoff tote bag in leopard-printed dyed calf hair (Brazil) and leather. Flat top handles with lobster clasp ends. 12"H x 19"W x 6"D.
For in-store inquiries, use sku #2688211. 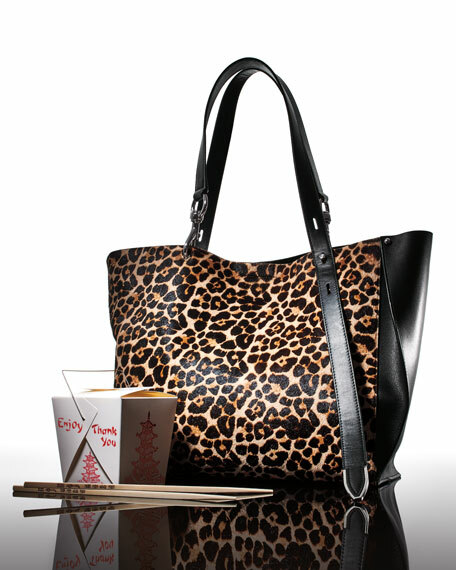 Liberty London tote bag in Iphis-print coated canvas with calf leather trim. 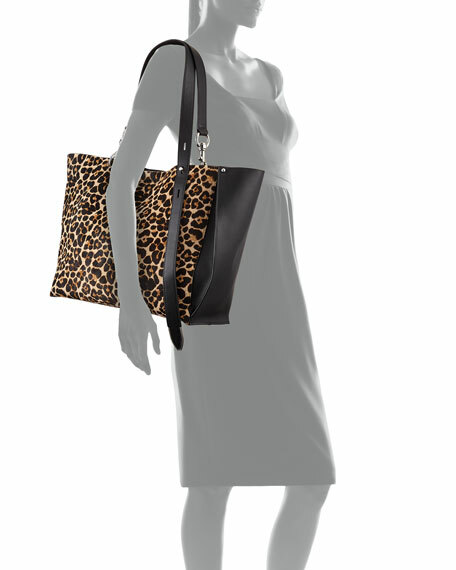 Thin shoulder straps with hanging ID tag, 11"
Liberty London tote bag in Iphis-print coated canvas with calf leather trim. Thin shoulder straps with hanging ID tag, 11" drop. Open top; snap closure. Snap sides expand bag. Inside, logo jacquard lining, one open pocket; key clip. 10.6"H x 15.4"W x 3.5"D. "Little Marlborough" is imported. Marc Jacobs pebbled leather tote bag with contrast stitching. Flat shoulder straps. Open top; two-way zip-around top closure. Exterior, hanging logo and padlock. Logo lettering at center front. Interior, contrast polyester lining. One zip and two slip pockets. 10.6"H x 14.6"W x 5.9"D. "The Editor" is imported. MICHAEL Michael Kors large tote bag in monogrammed logo PVC with leather trim. Flat shoulder straps with hanging logo charm, 10.5" drop. Open top. Exterior, logo lettering at center front. Interior, contrast canvas lining; one slip pocket. Leashed flap pouch bag. 12.8"H x 17.5"W x 5.5"D. "Eva" is imported.